Disclaimer: I received an advance reader copy of this book through Penguin’s First to Read. I am under no obligation to review the book. All opinions are my own. 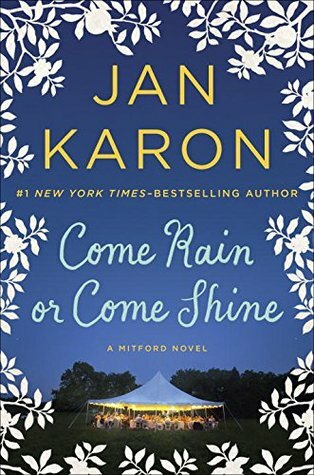 After having read all the Mitford books and even plenty of Jan Karon’s other books, I was so excited to pick up Come Rain or Come Shine. I felt like I had watched Dooley and Lace grow up so to watch as they finally started their new life together as husband and wife was fantastic. I love having a series of books to read. Each new installment is like a family reunion with characters you only see once in a while. Best, in Mitford, there always seem to be small changes, just like real small town life. Now, Dooley is finally a vet. People have moved and Dooley and Lace are getting ready to become the occupants at Meadowgate. Dooley has bought Hal Owen’s vet practice and a wedding is coming up. I laughed at the wedding being called The Big Knot. I actually loved everything about the wedding from it being a pot luck to Dooley’s childhood friend Tommy having his band provide the music. If you, as I have, love Mitford and Father Tim and his family, you will thoroughly enjoy Come Rain or Come Shine.